It was a beautiful morning for it - didn't get rained on once and the only time the wind really came into play was when it pushed Tom and I home along Plenty Rd. Dirty Deeds #2 is going to be a cracker - a lot of quality CX terrain in Darebin Parklands - just pray that they don't include the stairs! Trust me on this one! We made good time out to Plenty Gorge Park and I was bummed to see that the new housing estate at University Hill has encroached even more on the park. There's a big mob of roos that hangs out on the grassy plain there - the construction and fences and roads are getting closer and closer - soon there won't be any plains, just McMansions and Commodores. We skirted the lake and did a big loop that brought us back to the same creek crossing as before - I was last in line to cross and got impatient so I thought I'd execute an overtaking maneuver by splashing through the water next to the crossing. Pro tip: It's a _lot_ deeper than it looks! The mountain bike fun was over soon enough and we popped out onto suburban roads again. I dunno where my head was but I bombed down a hill (brakeless) with a roundabout at the bottom thinking that I'd blast straight through the roundabout and keep going. Except it was a t-intersection and there was no "straight through". I shat myself and started frantically trying to backpedal and get rid of the speed I was carrying so I could make the 90 degree corner - I *almost* made it but there was just too much speed so I ended up (somehow) hopping the curb and riding it out on the nature strip. I think we all thought I was going down for sure. A big "WTF?" to me for that one. Quick break at the servo and then we hit the rolling hills out towards the big climb. A bit of walking through here for me. Oh, and lots of map checking - I need a better navigation system than stopping at each corner, taking the piece of paper out of my pocket and looking up the next turnoff. Sorry guys! Lots of beautiful countryside through here - suicidal kangaroos, an alleged echidna sighting, and all under clear blue skies. We hit the fire-damaged area soon enough and that changed the tone a bit. Rolled up to Strathewen which is still being rebuilt. Understandably, back-road signage is probably not high on the list of priorities right now - or maybe my it was my dodgy navigation, anyway, we ended up on the wrong side of the power lines and found ourselves climbing up Bowden Spur Rd instead of Beale Ave. No matter, they both end up at the top. We stretched out up the hill - Scooter way in the lead, Reuben and Nik in the middle and Tom and I bringing up the rear. Awesome views from this road. Could see all the way back to the city, where we started. That kinda put the distance into perspective - the city looked so far away - no wonder we could feel it in our legs. Finally crested the hill, regrouped and rolled on to Pheasant Creek Bakery for a well-earned rest. Scooter kept saying how he wanted to do the descent down Bowden Spur Rd and then head across to Eltham where it was "all flat". When this dubious claim was challenged, he mentioned something about MC Escher and laughed. I was knackered and brakeless so I was definitely sticking to the plan of Humevale Rd then Plenty Rd tailwind all the way home - Tom agreed. Nik and Reuben fell under Scooter's spell and so the group split at Pheasant Creek and we pushed on. 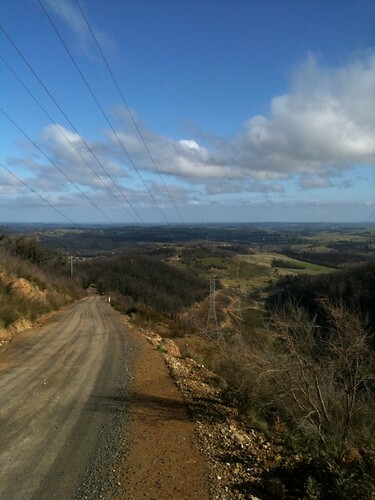 Tom and I got halfway down Humevale Rd when we met Brendan's "recovery ride" coming up the other way. Ha! Small world. We had a quick chat in the middle of the road, went our seperate ways and then hooked up again at the servo in Whittlesea. Good chats ensued and Tom and I tagged along Plenty Rd with the group until they turned off for more rollers. Plenty Rd was plenty fast - the wind was behind us and we span it in - pretty soon we were getting buzzed by Commodores and cursing the suburbs. We got to Latrobe Uni which is right near my place so I decided to pull the pin and get back to wife and son while Tom jumped back on the Darebin Creek trail.